Where are the European Green Crab in the Salish Sea Coming From? Finding a few isolated pockets of invasive European green crab in Washington’s Salish Sea over the past two years indicates the early stages of a possible range expansion. Certainly, it is the goal of WSG Crab Team and management to protect shorelines from the damage this crab has done in other parts of the world. In order to do that, it’s important not only to know where green crab are found – and to try to remove them – but also where they are coming from, and how they are getting here. This question was the topic of two research projects coordinated by Crab Team this winter and – spoiler alert – the answer is actually not what we originally expected! These projects aimed to learn about the possible sources for European green crab arriving in the Salish Sea using two very different tools: genomics and oceanographic modeling. It is often impossible to know for sure how an invasive species arrived in a new place. By using multiple lines of evidence that approach the question in very different ways, we are tring to piece together which of the possible sources had the most evidence on their side. Preliminary results from these projects were presented at the recent Salish Sea Ecosystem Conference, where we convened two special sessions on the status and management of European green crab in the Salish Sea. Though these projects are ongoing, we wanted to share some of the initial insights we’ve gained from this work. 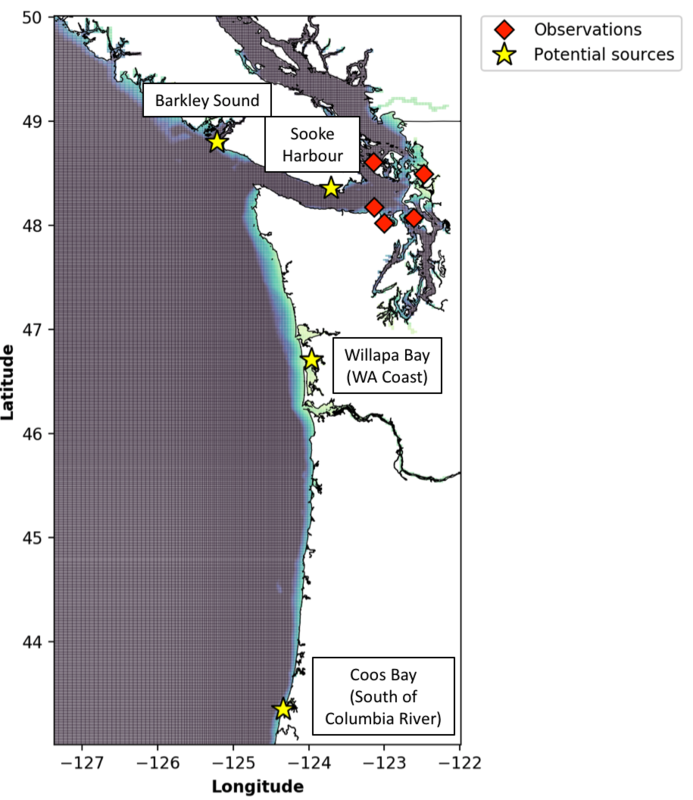 Crab Team collaborated to determine which possible source population (yellow stars) was the most likely source for European green crab observed in Washington’s Salish Sea (orange diamonds). Figure courtesy of E. Brasseale. Click to enlarge. To set the scene before diving into the nitty gritty, we went into these projects with a pretty strong hunch that green crab found in places like Westcott Bay, Padilla Bay, and Dungeness Spit over the last few years had arrived there as free-swimming larvae, having been released by adult crabs in the nearest known established population of green crab, in Sooke Basin, B.C. Because this population was so much closer than any possible source population, and larger than some of the populations, on the outer coast, it seemed most likely that larvae of green crab coming from Sooke would have the best chance to get to shorelines further into the Salish Sea. The oceanographic modeling by Elizabeth Brasseale using Parker MacCready and colleagues’ LiveOcean model suggests that Sooke wasn’t necessarily a more likely source of larvae for the Salish Sea than the possible coastal sources. Larvae coming out of Sooke often get washed outward towards the open ocean, but certain conditions called reversals can pull larvae in along the southern side of the Strait of Juan de Fuca from coastal populations even as far away as Coos Bay, Oregon. The Salish Sea isn’t regularly awash with green crab larvae. As the modeling work shows, it happens under somewhat rare, but fairly predictable conditions. And, even under those conditions, only relatively small numbers of larvae are able to get to Washington’s inland shorelines. The genomics work by Carolyn Tepolt at Woods Hole Oceanographic Institution confirms that green crab from the population at Dungeness Spit did not come from Sooke. They did come from one of the coastal populations (CA, OR, WA, or BC) – as opposed to somewhere else in the world – but it’s not possible to tell which. Interestingly, the green crab from Sooke are, genetically speaking, very distinctive from those on the coast, likely because the population is isolated and was founded by a small number of individuals. While this genomics technique typically requires a dozen or so samples to get good information, the unique signature of green crab from Sooke means we only need a couple of individuals from any new detection site to rule out (or confirm) Sooke as the source. Though this was surprising, it was reassuring that the two separate lines of evidence corroborated the story. In addition, we’ve noted a number of positive things about what this could mean for management. Because it is a somewhat rare, but predictable, event for larvae to get washed into the Salish Sea, we have an opportunity to keep ahead of the invasion through regular monitoring and a robust infrastructure for rapid assessment and response. If we had evidence that Sooke was frequently drenching Washington’s inland shorelines in larvae, it would be a much tougher situation to manage. Work on both of these projects will continue, as we add to and refine the information in these datasets. But the collaborations and tools developed in the last few months have set the stage for much more powerful and informed management than would otherwise be possible. Though Sooke does not appear to have been the source population (for the green crab at Dungeness Spit, at least), managers in Canada are still very much engaged in building a partnership across the Salish Sea to reduce the impacts of European green crab. Already this work is a hugely collaborative effort, and we want to acknowledge those groups that funded these these projects including: Friends of Dungeness National Wildlife Refuge, the Lower Elwha K’lallam Tribe, the Port Gamble S’Klallam Tribe, and the Puget Sound Marine and Nearshore Monitoring Program through Washington Department of Fish & Wildlife. More information on the discussion at the conference surrounding management of European green crab in the Salish will follow in another post tomorrow.